* Psalm 111:10 and Sir 1:16. István B. Veszprémi (Weszprémi) was born in 1637 or 1638. He studied in Sárospatak. In 1661 he became Senior, and in the same year Rector in Szatmárnémeti (Satu Mare). In 1664 he set off for foreign universities. After Franeker, Groningen and Utrecht he was immatriculated in 1666 in Leiden, and in the same year he returned to Szatmár to provide for his office of Rector. In 1671 he became the court minister of Lady Kemény, after 1675 minister and dean in Székelyudvarhely (Odorheiu Secuiesc). In 1691 he was elected Bishop of the Reformed Diocese of Transylvania. He died on September 22, 1713 in Gyulafehérvár. Besides several laudatory poems and a role of respondent, his works are: Disputatio theologica prima, de vera notitia fidei adversus caecam pontificorum fidem. Ultrajecti, 1666. – Disputatio theologica analyticorum papisticorum secunda. Lugduni Batavorum, 1666. 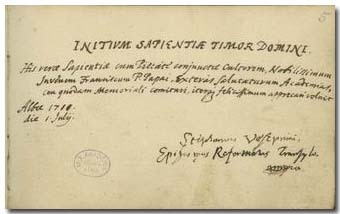 The old Bishop of Gyulafehérvár was the first to note in the Album of the young Ferenc Páriz Pápai setting out to foreign academies, on July 1, 1711. The Hungarian War of Independence lead by Rákóczi (1703-1711) had already finished by then. – Nevertheless, Péter Nádudvari, brother-in-law of Ferenc Pápai Páriz, had already noted in the Album in the previous year (p. 23. ).